Trentinney farm has Six holiday cottages and is situated in a peaceful setting covering 158 acres of some of the loveliest countryside in North Cornwall, with beautiful views of the surrounding countryside and from the top of the farm (as seen at the very top of this page) spectacular views of the sea and moors. It is a mixed farm with crops, cattle, sheep, and some poultry. The traditional stone built barns, most of which are listed buildings, were built of local stone and slates from the nearby slate quarry at Delabole. Some of the buildings date back to the 16th century, but the history of Trentinney goes back much further. According to legend, around the year 960 King Arthur killed the Lord of Tretiny (Trentinney) after the Lord had killed a white cow belonging to Arthur's niece, now known as St Endellentia. 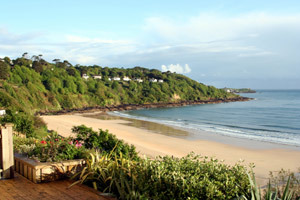 Some of the most beautiful beaches in Cornwall are within a few minutes drive from Trentinney Farm Holiday Cottages. Polzeath, Port Quin, Padstow, Rock, Tintagel, Boscastle, Camelford, Wadebridge, and many more are all within a short drive. Polzeath is one of the finest beaches in the British Isles with fine golden sand and rock pools. It is popular with Malibu surfers and those who prefer a boogie or belly board. Rock offers sailing, wind surfing, water-skiing, and fishing trips. For golfing enthusiasts there are several golf clubs in the area. Lanhydrock, Trerice, Pencarrow and Prideaux Place are all historic houses with beautiful gardens, all are within easy reach of Trentinney Farm. Port Isaac, Tintagel (home of King Arthur’s castle), Boscastle, and Rock are all close by. 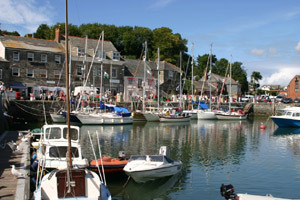 A short ferry ride from Rock will take you to Padstow, with its picturesque harbour, stone cottages, and restaurants. The Camel Trail is very popular with walkers and cyclists (bicycles can be hired at Wadebridge). The trail follows the beautiful River Camel downstream to Padstow with spectacular views of the estuary, and upstream to Wenford with its beautiful scenary and abundance of wild birds. There are footpaths leading from Trentinney Farm in all directions, why not take a walk to Port Isaac?